WA, which used to export large numbers of aluminium vessels around the world, now sends far fewer completed ones but a lot more kits for assembly overseas. A minor trend is for local prospective boat owners to buy themselves flat packs and put together their own trailer boats; an updated version of the bondwood dinghy kits of the 60s. 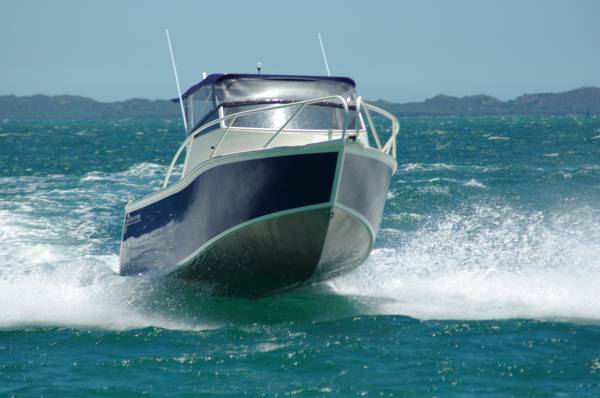 Of course a buyer could opt for having a professional fabricate the boat, and do the fit-out himself as money accumulated. The kit costs $12,990, and consumables might add another thousand. That takes you to what is known as a Stage 1 hull which, if you paid a professional to make it, would cost perhaps $28,500. It would then need a motor, steering, trailer, upholstery, electronics, paint, windscreen, canopy and so on. A complete owner build would cost between $55,000 and $65,000. 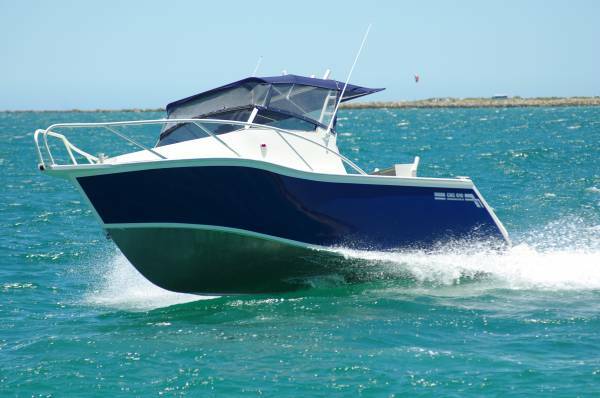 The route of building it yourself or buying a Stage 1hull allows you to delete or defer items, or buy second hand, and manoeuvre the boat around your budget. Plenty of keen fishos could live without paint, for instance. And the boat itself? 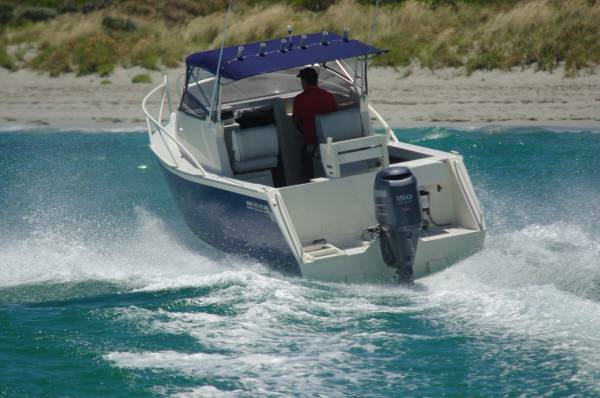 It is a competent all rounder, intended to be easily interchangeable between the fishing and family roles. The cabin has a part time compartment for the toilet, accepting a chemical toilet at the same height as a domestic model. The fishing purist can remove it, converting the space into a locker by fitting the detachable lid. Similarly, the cantilevered extension for the awning has a neat and quick system for removal to suit the angler who wants extra casting clearance. Anglers are provided with a range of goodies: self-flooding catch tank with plumbing for the deck wash to replenish it, bait station, bait tank, toe space, and a good sitting arrangement. The reversible seats are mounted on locker boxes that have a lower level rear extension to provide foot rests. These are also well positioned to act as steps up to the side decks, which is useful as the deck is the only access forward; windows and fore hatch are absent, presumably in the interest of building simplicity. Without taking much away from the cabin volume, the decks are wide enough for the transit job. Storage has been given plenty of attention. 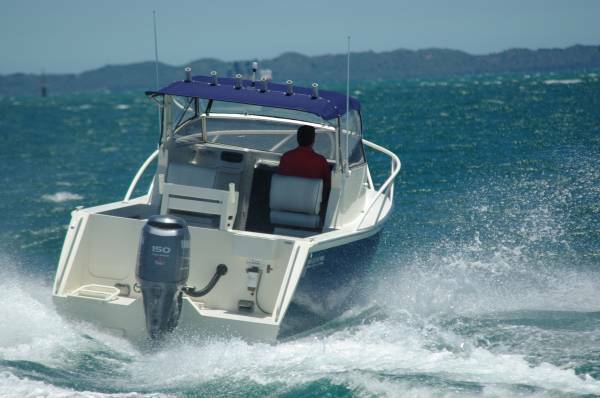 As well as under bunk and under seat lockers, there is a pair in the transom plus a dry under deck compartment, and side pockets are on two levels. Enough space has been left between seat boxes and the sides for the likes of a day pack to be stowed. The cockpit has plenty of room for four fishermen or a large family, thanks to a well judged share of boat devoted to the cabin: it is only as long as it needs to be to sleep a pair of average height adults. 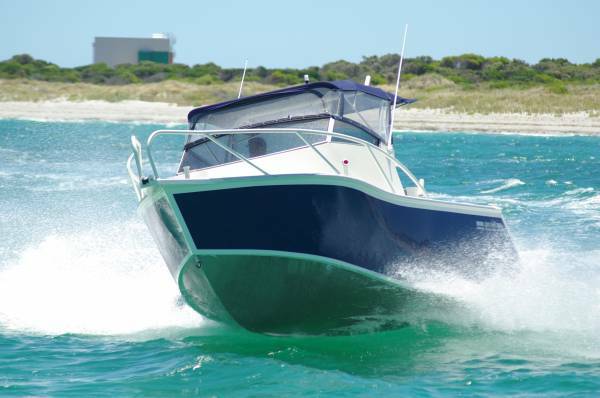 The howling sea breeze of the review day gave the boat its chance to impress under way and it took the opportunity: it is distinctly above the aluminium average for ride, and in recent years that average has been rising. It also showed itself to be a dry boat, just the odd wisp of spray sprinkling the windscreen and nothing reaching the cockpit. Stability is there in spades too. We had only about 150kg of live weight to stress the boat with, but the minimal effect of moving it around suggested a solid platform for those four anglers. As the designer intended this is an attractive all rounder, and perhaps an attractive project for next winter.